Results-based management (RBM) is defined as orienting all action and use of resources towards achieving clearly defined and demonstrable results. RBM increases transparency and accountability, allowing interventions to complement each other and avoid overlap and waste. Three interconnected processes, namely good planning, monitoring and evaluation (M&E), can greatly enhance the effectiveness of investment projects and plans. Good planning helps to focus resource allocation and subsequent implementation on the results that matter. Effective M&E (see M&E) helps to assess progress towards the achievement of results and to learn from the past to ensure that future initiatives better contribute to development impacts. RBM can be defined as a “broad management strategy” aimed at achieving significant changes in the way public and private sector actors (institutions, agencies, projects/plans) operate, with improving performance (i.e. achieving better results) as the primary goal. Management improvement is one driver of RBM and refers to management learning and decision-making processes. Performance reporting, another driver, can inform and improve resource allocation. RBM operates according to the Results Chain theory (see Figure 2: Results Chain), which describes the cause and effect relationships among different levels of results, i.e. measurable development changes1. The Results Chain is reflected in the Result Framework (RF) matrix. Different organizations use similar conceptual tools that are designed to organize information regarding intended outcomes and results, such as logical frameworks (“logframes”) and outcome mapping. Indicators are selected for each level. Aspects of RBM discussed in this Note are relevant to all of these different concepts. RBM frameworks are more effective if they are developed with consultation and buy-in of key stakeholders, who will contribute to making them work and use the information to inform their activities. Participation and buy-in are essential for RBM frameworks to be effective tools for mutual accountability between partners working towards common goals. What do we want to achieve? Identify the vision, goals and objectives to be achieved in each (programme) area of the plan or project. For this step, key planning tools are existing national-level objectives and results frameworks. How will we do it? Formulate the strategy to be adopted to achieve the set goals. For this step, a key planning tool is the activity/outputs matrix, i.e. RF. What resources are required? Determine the inputs (financial, human resources, etc.) required to deliver the intended outputs. For this step, a key planning tool is cost tables [see Costing]. How will we know we are on track? 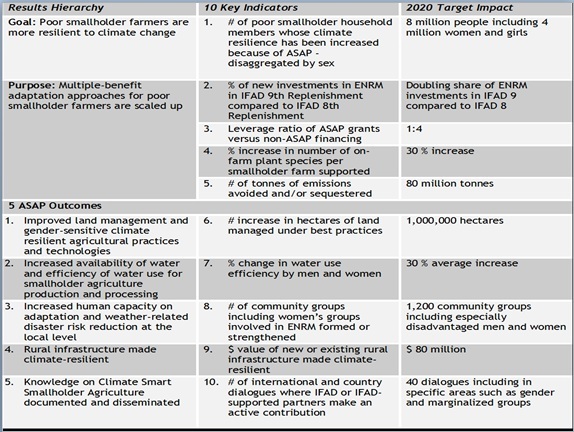 Outline arrangements for monitoring progress towards the results (as part of implementation arrangements), and evaluate the impacts being achieved. For this step, key planning tools are M&E plan/system/framework [further referred to as ‘system’] and arrangements (see M&E). What are the risks and assumptions? Identify potential risks by identifying potential events that can occur and identifying the exposure level during implementation. Risks can be mitigated through specific measures to be taken and integrated in choosing the appropriate activities (see Risk Analysis). A results framework also often identifies any underlying critical assumptions that must be in place for the intervention to be successful, that is, to lead to achieving the targeted outcomes and impacts. How to use result frameworks and logframes? One of the key strengths of the RF / logframe [further referred to as ‘RF’] is that it guides the planning team to build into the design a plan for how the project will be monitored, reviewed and evaluated towards desired results. Indicators are identified to show how change will be measured from the baseline at the time of design. Targets are set, to be achieved by the end of a defined time frame, together with milestones to measure progress along the way. Different types of indicators correspond to each level of the RF: input (resources); activities/process; output (operational change, i.e. products and services, knowledge, skills, capacities); outcome (institutional change in performance, individual behavioural change in practice); and impact (change in the lives of people). Generally speaking, indicators selected should vary (e.g. product vs. progress, direct vs. indirect, qualitative vs. quantitative) and they should be SMART (specific, measurable, attainable, relevant and time-bound). In some cases it might be necessary during the design phase to collect secondary baseline data to clarify the assumptions for the project (in addition to full-fledged baseline data surveys at the beginning of implementation (see Impact Evaluation). It is difficult, if not impossible, to establish a reasonable performance target without an indicator baseline – i.e. the value of the indicator just before project implementation begins. Input indicators are quantified, time-bound statements of the resources financed by the project and are usually monitored by routine accounting and management records. They are mainly used by managers closest to implementation, and are consulted frequently (daily or weekly). They are often left out of discussions of project monitoring, although they are an essential part of management information. Data sources for input indicators include project agency/service provider records, progress reports and beneficiary group records. They are ultimately important to assess how efficiently results are achieved (i.e. are they delivered in a timely and cost effective manner – see below), and particularly important to track in beginning of project (e.g. rate of fund disbursement). Output indicators describe the production of goods and delivery of services by the project. They are often evaluated and reported using performance measures based on cost or operational ratios. For example: number of kilometers of all-weather highway completed by a given date; percentage of farmers attending a crop demonstration site before fertilizer top-dressing; number of teachers trained in textbook use; cost per kilometer of road construction; crop yield per hectare; ratio of textbooks to pupils; amount of time to process a credit application; number of demonstrations managed per extension worker; steps in the process of establishing water-users’ associations. Data sources for output indicators include project agency/service provider records and progress reports and beneficiary group records. Outcome indicators are specific to a project’s purpose and reflect the logical chain of cause and effect that underlies its design. Often achievement of outcomes will depend at least in part on the actions of beneficiaries responding to project outputs, and indicators will depend on data collected from beneficiaries – e.g. changes in crop yields or cropping patterns or level of investment by farmers in land management improvements. As such their achievement is not entirely under the control of the project management, especially where they relate to beneficiary behaviours such as adoption rates. Data sources for outcome indicators include beneficiary group records, microfinance institution records, quantitative/qualitative surveys (e.g. level of adoption, increase in production, rise in sales, changes in road traffic), key informants (e.g. increase in use of markets), technical measurements (e.g. crop transects). Impact indicators usually refer to medium- or long-term developmental changes to which the project is expected to contribute. Dealing with the effects of project outcomes on beneficiaries, measures of change often involve statistics concerning economic or social welfare. Data sources for objective or impact indicators include existing regional or sectoral statistics, surveys of beneficiaries and outcome (quantitative) surveys, supplemented by informal methods (focus group discussions, etc.). It is important to ensure that evaluation criteria are correctly reflected in both the project logic and the project indicators. Impact and outcomes correspond to relevance and impact of the project. Outputs, activities/process and inputs correspond to effectiveness and efficiency of the project. All indicators will eventually be used to formulate assessments about the sustainability of the project. Selection of overly complex indicators. This presents major problems for data collection, either in terms of skills or resources required. any preconditions for the activity, including the production of another output. Clarification of a detailed work plan generally happens in the first few months of implementation, the inception phase. Annual work plans (depicted in Figure 3: Example Work Plan in Gantt chart ) enable the project designers to gauge whether, using the resources planned, it will be possible to complete all the project activities and produce the outputs in the time allocated. overly optimistic assumptions about possible achievement rates. effective M&E mechanisms, building on existing systems. The RF helps to plan the plan’s expected results at the macro level and informs the development of an M&E system to assess progress towards the achievement of those results. Specific activities and related outputs are normally not included, to ensure that the RF keeps the focus on long and medium-term results (impact and outcomes). guides the implementation of investment plan programmes and projects towards the set objectives. As these plans are leading to national level, sector results should also be measured by at least some indicators that can be tracked in from national (agricultural) statistics. Variation in the proportion of affected population in need of humanitarian assistance and food aid; percentage of households below the Acute and Chronic Food Insecurity level; number of drought emergencies recorded in the targeted countries by biennium; average annual household income; assets levels of drought-prone communities. Percentage of households having secure access to sustainably managed natural resources; response time between early warning and response; percentage of national recurrent budget available for early warning response. Number of kilometres of irrigation canals constructed; water management board established; equipment purchased; percentage of drought-prone communities having access to updated and appropriate information on water. Clear tool to help underline starting points and expected outputs of a project, stress its purposes and focus on the activities, while sharing knowledge with stakeholders. Provides guidance for developing RF that can serve as a key tool to establish strategic objectives and to link interventions to intermediate outcomes and results directly related to those objectives. 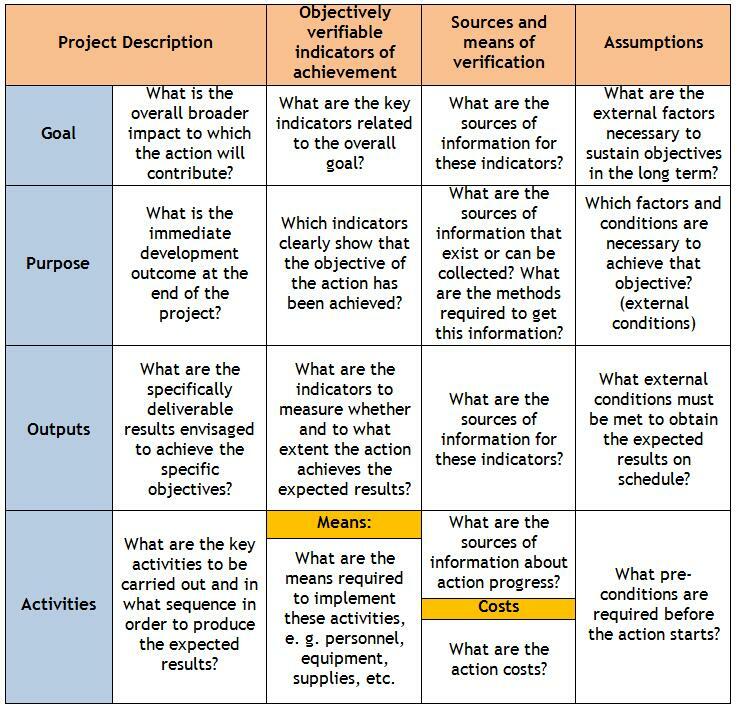 Key points about which ME&L approaches, methodologies and processes best serve projects in achieving results, as well as how to combine MIS and ME&L systems to ensure their usefulness for project management. Provides overview of problems of putting M&E into practice and identifies absence of clearly identifiable monitorable indicators and a lack of ownership and participation by the stakeholders as main weaknesses. Includes also guiding principles for result-oriented project M&E systems as a result of the review. Provides guidance regarding setting project objectives and reviewing alternative approaches to solve a given development problem. It emphasizes the involvement of stakeholders from the outset of project identification. Provides guidance to aid the design and implementation of effective project M&E. Emphasizes the involvement of stakeholders in design and implementation and discusses how to create a learning environment for managers and for project implementation. Practical tool focused on drawing up, correcting and implementing M&E plans. Provides (indicator) examples and check lists. The glossary of key terms in evaluation and results-based management should facilitate and improve dialogue and understanding among all those who are involved in development activities and their evaluation, whether in partner countries, development agencies and banks, or non-governmental organisations. It should serve as a valuable reference guide in evaluation training and in practical development work. These documents are made available under a Creative Commons ‘Attribution - Non Commercial – No Derivatives 4.0 International licence’ (CC BY-NC-ND 4.0).